The U.S. Department of Transportation (USDOT) has provided significant investment in high-speed rail planning and design over the past five years through the High-Speed Intercity Passenger Rail Program (HSIPR). The Federal Railroad Administration (FRA) completed a study in 1997, High-Speed Ground Transportation for America, which concluded that high-speed ground transportation’s total benefits exceed total costs in most corridors, especially those whose distance is between 100 and 600 miles, thereby contributing to the continued investment in passenger rail programs. 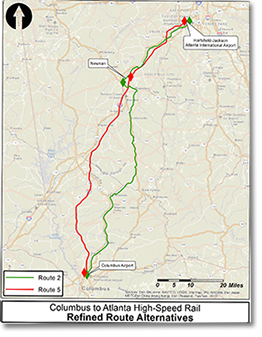 The FRA and Georgia Department of Transportation (GDOT) have invested in high-speed rail in Georgia over the past few years with three feasibility studies: Atlanta-Birmingham, AL; Atlanta-Jacksonville, FL; and Atlanta-Louisville, KY; and two environmental impact analyses — one for the Atlanta to Charlotte, NC, corridor and the other for the Atlanta to Chattanooga, TN, corridor. Also, they will be updating the Georgia State Rail Plan over the next couple of years. The Columbus to Atlanta corridor is another spoke in the high-speed rail wheel for the metro Atlanta area, providing alternative transportation services to the third largest city in Georgia. The Columbus Consolidated Government (CCG) retained HNTB Corporation to provide planning services to evaluate the feasibility of high-speed rail in the Columbus to Atlanta corridor. This study area concentrated on a new high-speed rail corridor from Columbus traveling northeast to Hartsfield-Jackson Atlanta International Airport (H-JAIA). The feasibility study involved socio-economic and transportation data collection; forecasting; planning and integration; economic and financial analysis; and stakeholder involvement. The study began in Spring 2013 and was completed in late 2013 with the report available in February 2014. The study engaged in extensive analysis to determine feasibility for the three high-speed rail alternatives: Emerging, Regional and Express. EMERGING HIGH-SPEED RAIL > utilizes abandoned and active rail corridor right-of-way and is intended for developing corridors of 100-500 miles with a strong potential for future Regional or Express high-speed rail service. Emerging rail uses diesel locomotives to achieve top speeds up to 90 – 110 mph. REGIONAL HIGH-SPEED RAIL > accommodates relatively frequent service between major and moderate population centers, 100-500 miles apart. Regional rail involves establishing a new passenger rail corridor but can utilize existing interstate and state highway corridors, private railroad right-of-way and greenfield alternatives. Diesel-electric locomotives achieve top speeds of 110-150 mph. EXPRESS RAIL > is frequent, quick service between major population centers with few intermediate stops. Top speeds range from 150-220 mph on completely grade-separated, dedicated rights-of-way. Electrified locomotives are used to achieve these top speeds. Express Rail involves establishing a dedicated passenger rail corridor along interstates, state highways and greenfield alternatives. The study team gathered input from local advisors and stakeholders and combined this information with quantitative and qualitative screening processes to select the two representative routes. These routes demonstrated the potential to deliver a high level of service with fewer public and environmental impacts. Route 2 (in green,) represents the Emerging High-Speed Rail analysis. It follows the abandoned right-of-way from the Columbus Airport through Pine Mountain and Raymond where it transitions to or adjacent to the existing rail before making its way to the Hartsfield-Jackson Atlanta International Airport (H-JAIA) area. Route 5 (in red,) represents the Regional and Express alternatives. It generally follows I-185 and I-85 but transitions to or adjacent to existing rail right-of-way near Fairburn in order to access the H-JAIA area. Using two representative routes and a set of carefully selected operating parameters (i.e., train equipment type, fleet size, travel times, round trips per day, etc. ); the study generated potential ridership, revenues, operations and maintenance (O&M) and capital costs for each high-speed rail format for years 2030 through 2050. The Operating Ratio, a key FRA metric of feasibility, was computed for each alternative, measuring the ratio of operating revenues to operating expenses. Rail system alternatives achieving an operating ratio greater than 1.0 are deemed to be operationally feasible, as they successfully generate revenues to offset or exceed operating expenses. The Study results show that both the Express and the Regional high-speed rail alternatives are operationally feasible, with both producing operating ratios greater than 1.0 for years 2030, 2040 and 2050. For the year 2030, the Express rail system would generate an estimated $28.5 million in revenues against $23.5 million in expenses to produce an operating ratio of 1.21 (amounts are 2030$). Ridership (one-way trips) is projected to be 1.1 million by 2030. The Regional system would generate $24.6 million in revenues to offset $21.5 million in operating expenses to produce an Operating Ratio of 1.15. By comparison, the Emerging rail alternative is projected in 2030 to generate $16.7 million in revenues against $19.9 million in operating expenses for an operating ratio of 0.83 with an estimated annual ridership of 775,000. Thus, the Emerging alternative is not projected to be operationally feasible. Estimated capital costs (planning, design and construction) were estimated using FRA’s costing methodology. These estimates are relatively similar to other passenger rail estimates in the region including studies conducted by the Georgia Department of Transportation (GDOT). Thus, the Columbus to Atlanta corridor is deemed feasible for high-speed passenger rail service based on the data collected and the technical analysis. Moving forward, the CCG will begin working on both immediate and long-term next steps for successful implementation. These include incorporating the study into the Georgia State Rail Plan, preparing for the next planning and environmental assessments, and identifying funding/financing strategies for implementation. The Final Report further details the study’s methodologies and results and will be available February 2014. To download the project summary sheet, please click here. Emerging High-Speed Rail generally involves utilizing rail corridor owned by a freight railroad. This type of service is also commonly called “Shared Use”. Diesel-electric Tilt Train Technology is proposed for Shared Use corridors due to the extreme curvature on these alignments. Travel speed typically achieves top speeds of 90-110 mph. Regional High-Speed Rail uses grade-separated passenger-only corridor with diesel-electric technology. However, this option will share right-of-way in terminal areas in order to access stations. Travel speeds can reach up to 150 mph but will generally average a top speed of approximately 130 mph. Express High-Speed Rail is developed on a completely grade separated (no roadway crossings), electrified, and dedicated track with possible exception of some shared right-of-way in terminal areas. Express High Speed Rail is intended to relieve air and highway capacity constraints and achieves top speeds of 180-220 mph. Why is a study of High Speed Rail between Columbus and Atlanta being conducted? Transportation needs are ever-growing in the Southeast, and the Federal Railroad Administration in conjunction with the Obama Administration has dedicated funds to study the feasibility of high-speed rail as a possible solution to help meet future demands on transportation infrastructure. High-speed rail is a quick, reliable, energy efficient, environmentally clean and comfortable option for city-to-city travel. Rail passengers are relieved of issues including parking, traffic congestion delays and personal vehicle maintenance costs. The presence of high-speed rail can also create jobs, support economic stability, and spur revitalization and community reinvestment. What alternatives will be evaluated? 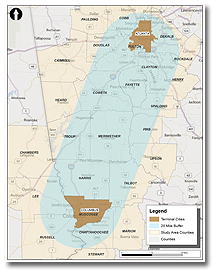 The study area for the Columbus to Atlanta High Speed Rail corridor includes the following counties: Paulding, Cobb, DeKalb, Rockdale, Douglas, Fulton, Clayton, Henry, Carroll, Heard, Coweta, Fayette, Spalding, Troupe, Meriwether, Pike, Harris, Talbott, Upson, Muscogee, Chattahoochee, Marion, and Stewart Counties in Georgia and Chambers, Lee, and Russell Counties in Alabama. Following stakeholder input and a technical analysis, the study evaluated two representative route alternatives as a basis for feasibility. The representative alternatives are not preferred alternatives or recommendations, but acted as a basis for feasibility of the corridor as a whole. One representative route, the Regional alternative, was determined for shared use options (utilizing existing railroad right-of-way), and one representative route, the Express alternative, was evaluated for dedicated use (passenger rail-only). How does this feasibility study fit into the overall project development process? The feasibility study included alternatives development, ridership forecasts, operation and maintenance costs research, and capital costs determination for each representative alternative. Ultimately, the study postulated the basis for establishing whether the corridor is a feasible candidate for further studies and provided insight into possible alignment and technology options. Is the Columbus to Atlanta corridor feasible? Yes. Based on the technical analysis of the three high-speed rail formats evaluated, (Emerging, Regional and Express) the corridor reflects operationally feasible results. An operating ratio greater than 1.0 (a key FRA measurement metric for feasibility) indicates that the rail system is efficiently generating revenues compared to expenses. Based on the analysis inputs, the Regional and Express alternatives produce favorable operating ratios greater than 1.0 for all projected years (2030, 2040 and 2050). 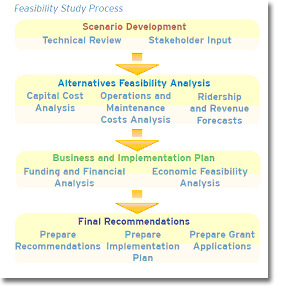 What happens after the feasibility study is complete? Once a feasible alternative corridor is determined, the next steps in the project development process would typically be to complete required National Environmental Policy Act (NEPA) evaluations and develop a Service Development Plan (detailed operational plan) for high-speed rail in the corridor. There are three groups of stakeholders involved in the study process: the Mayor’s Commission for Passenger Rail including representatives from the Columbus area with a vested interested in passenger rail; a Technical Advisory Group including representatives for business, education, military, other transportation modes and political leaders; and counties and municipalities within the study area. To provide comments regarding the project, click here.